Transforming pain into positive action. The tragic drowning of a Milwaukee teenager is prompting his family to help others. "I didn't know that real feeling of love until I brought him home after he was first born on December 23rd," said Adebisi Agoro II. "It was on Christmas. He looked into my eyes. Our eyes locked. I'll never forget it. He was such a gift." From day one, Adebisi Agoro II, and his son were best friends. They shared the same name and an unbreakable bond. Now, Agoro is learning how to live without his only son by his side. "It's a tough reality to grapple with," he said. "The rest of my life I can only wake up with memories. I will never be able to create a new memory with him. I miss hugging him the most, and his laugh." Adebisi Agoro III was only 14-years-old when he died. He was a great student, exceptional athlete, and loving brother. He was set to start high school this fall. "He was a ball of joy, love, warmth and affection," Agoro said. "A teenager who still had a soft heart. He was one of my greatest accomplishments. I'm an artist. I consider him, and all my children, the greatest work I ever created." Agoro III died in June, after jumping into a Walworth County lake, without his life jacket properly secured. "It was a family trip," Agoro said. "I was there. I was the immediate responder to the whole situation." Now his mission is to make sure it doesn't happen to anyone else. "I believe we got too comfortable," Agoro said. "We had made that trip many times. Sometimes unknowingly, you can become a little lax with checking all the swimming equipment." Nearly 900 children in the U.S. drown every year. But African-American children and teens are nearly 6 times more likely to drown than white children. Formal swim lessons can reduce the chance of drowning by about 88 percent. "As black men, we teach our kids how to shoot a jump shot, but can we teach them to preserve their own life in the water?" Agoro said. "It's something we need to think about. Drownings happen more than anyone knows, and it only takes seconds." He's pushing for free swim lessons for all Milwaukee kids. 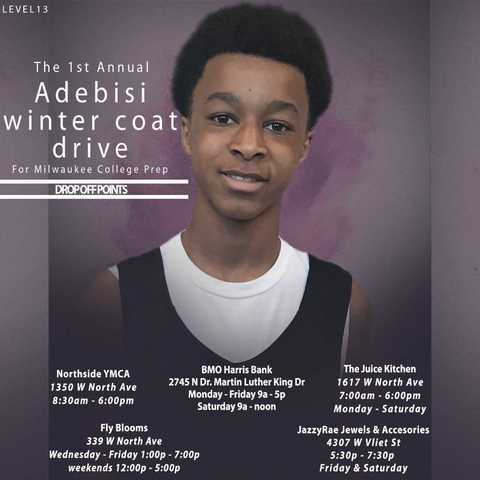 As a start, Milwaukee College Prep on North Avenue, where Agoro III attended elementary and middle school, is working with the local YMCA to put together scholarships for a swimming-lesson program for all students. Agoro and the school have already started a children's winter coat drive, to honor Agoro III. "He epitomized warmth and love, and always wanted to help others," Agoro said. "His life and legacy will live on." So will Agoro's message to other parents: "After what I've been through, I would remind everyone to live and love fully. Be an active part of your children's lives. You never know when you don't get that tomorrow." Northside YMCA - 1350 W North Ave. 8:30 a.m. - 6 p.m.